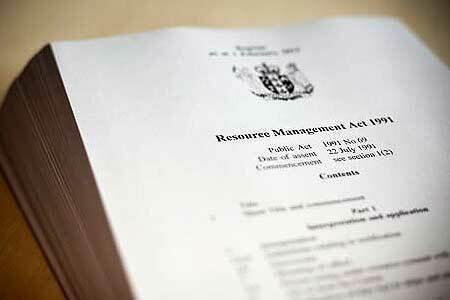 The Government is proposing sweeping changes to the Resource Management Act. They had planned for even more radical change but the support parties refused to commit so the proposal to weaken the goal of environmental protection by merging sections 5 and 6 of the RMA was removed. The currently proposed changes include one which would give the relevant Minister extraordinary regulation making powers. If section 360D is enacted he could prohibit a local authority from making specified rules or specified types of rules in a District Plan and override existing rules. What is currently preserved to Local Councils will become something that the Minister can direct by regulatory fiat. There is a limitation in that the Minister has to believe that the existing or proposed rules are restricting land use for residential development in a way that is not reasonably required to achieve the purpose of the Act but for Auckland this is not much of a restriction. And he has to engage in consultation with the affected authority but the powers are significant. The bottom line is that the Minister could make regulations which would affect matters that locally are considered important and the ability of Councils to include in their plans protective measures reflecting the needs and wishes of the local community would be compromised. The proposal raises a number of questions. What happens when a Council wants to change the provisions imposed by regulation? When can these changes reviewed? And presumably the ability for a local to seek a plan change would no longer exist if the area of concern had been addressed by regulation. There is a consultation process that the Minister has to set up if he is thinking of using these regulatory powers. But his discretion is huge. All he has to be is satisfied that a change is desirable and the threshold is met. There are also increased powers given to the Government when formulating National Policy Statements. It is proposed that the powers exercisable under a NPS include the ability to put constraints or limits on the content of policy statements or plans and the power to direct objectives and policies that must be included in regional policy statements and plans which are currently set by councils. A recent example of the sorts of things that could occur was the Government’s removal of blanket tree protection. This had to be achieved by statutory change but from now on the Minister could regulate to stop Council making similar rules. The clause has been described by David Parker as the dictator clause. He is not wrong. Another example involves Councils wanting to be GMO free. As long as the conditions are met this could be prevented. The Government has already tried with a change inserted at the last minute to use the National Policy Statement procedure to override Councils that want to be GE free. Either of the proposed changes would make this easier to achieve. Another area of concern involves proposed changes on the making of submissions to a policy statement or plan, change to or review of a policy statement or plan, a resource consent, review of a resource consent or change of a condition. The change proposes that submissions be struck out if a Council is of the opinion that the submission is not supported by any evidence, or the evidence is prepared by a person who is not independent or who does not have sufficient specialised knowledge or skill to give expert evidence. This would preserve the submission making process largely to those who have the funds and resources to pay for professional submissions to be prepared. Local community groups would find it very hard to have their opinions heard. If you want to make submissions the Bill is here and details on how to make a submission are here. The deadline for making submissions is 14 March 2016.